Your shopping basket contains items. If you'd like to receive a free copy of our latest catalogue, please enter your name and address details below. Please note that our new season catalogue will be available at the start of the New Year. All requests received in the meantime will be held and processed then. Our email subscribers are sent regular emails with news, offers and discount codes. If you'd like us to add your email to this list, please enter your address below. Don’t let greedy birds steal the fruits of your labours! 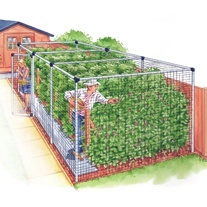 Our Fruit Cages have been designed to offer protection to your crops for years to come. Robust tubular aluminium framework is connected by strong, black UV stabilised nylon joints and is available in Standard (plain aluminium tubes) or Deluxe (green powder coated) versions. British Made. Doors and corner braces available separately. Each cage measures 6ft high with uprights at every 6ft point. Available in twenty-four standard sizes. Fine ¾in mesh netting (to cover top and sides), clips and pegs included. Aluminium tube diameter ¾” (19mm). Depth in ground 12in. Optional door supplied with an extra upright. 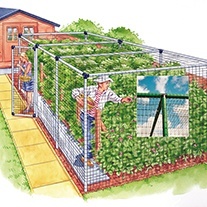 Keep medium height crops protected. Light and easy to move from crop to crop. Robust tubular aluminium framework is connected by strong, black UV stabilised nylon joints and is available in Standard (plain aluminium tubes) or Deluxe (green powder coated) versions. British Made. Fine ¾in mesh netting (to cover top and sides), clips and pegs included. Measuring 3ft high (with a further 6in in the ground). Phone lines are open 8am to 8pm Monday to Friday and 9am to 5pm weekends. Calls cost the same as calling 01 and 02 numbers and count towards inclusive allowances on landlines and on mobiles. To join our mailing list and be kept up to date with all of our latest news and special offers, please enter your details below.